On the day prior, Vesuvius was belching smoke. It was an overcast sky with the threat of rain. About midnight, I went out of my billet to answer the call of nature. While outside, in a mild drizzle, I was hit on the head by what I thought was a small rock. Suspecting some sort of joke, I went inside for a flashlight. When I returned, the light revealed a layer of damp cinders on the ground. We knew at that time that Vesuvius was erupting. We began to feel the earth shake as though a bomb had gone off. The eruption lasted for five days, between March 18 and March 23. 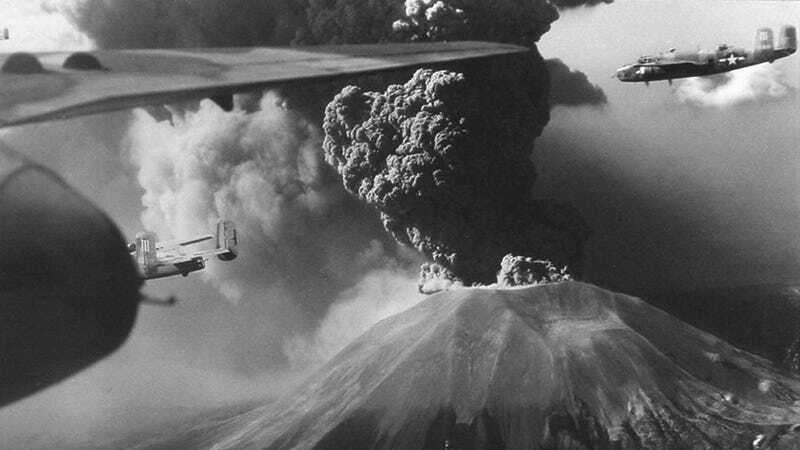 By the time it was over, “nearly all of the 340th’s B–25 Mitchell medium bombers were covered with hot ash that burned the fabric control surfaces, glazed, melted, or cracked the Plexiglass, and even tipped some B-25s onto their tails from the weight of the ash and tephra”, as described by Kaiser. Between 78 and 88 bombers were lost, more than to a severe Luftwaffe raid two months later, but nobody was killed. Don Kaiser’s page has dozens of fantastic photos of the eruption collected from various public and private sources. There’s a lot of lava. And bombers.